To celebrate reaching a 1,000 subscribers on YouTube - thank you so much - here's a giveaway, as promised. It is open until November, so that I can have a final Christmas giveaway at the end of the year. As usual, it is open worldwide, to my YouTube subscribers. 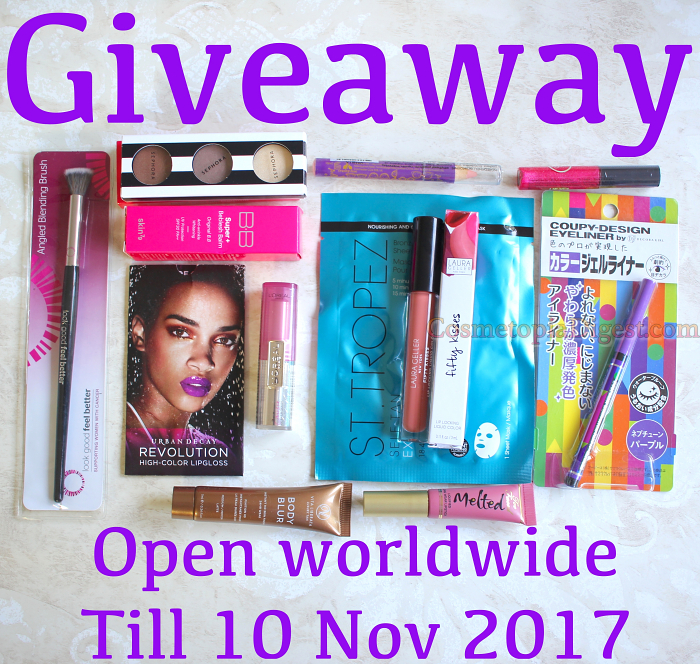 Scroll down to enter the Fall Makeup Giveaway 2017 and win as assortment of 12 beauty products including lipstick, eyeshadow, eyeliner, and more. P.S. The LookFantastic Beauty Advent Calendar for 2017 is out - preorder yours now here! Check out what we know so far here. The rules - do read them! The giveaway ends on 10 November 2017. I will announce the winners once I verify the entries (which could take a couple of weeks, depending on my schedule in early November, and the number of entries). If I do not hear back in 48 hours, I will choose another winner. If the post office tells me I cannot ship something among these, I will replace them with other products of my choice. International postal systems are now cautious, so there could be delays of eight weeks or more since each postal system and customs tends to examine everything multiple times. Good luck to everyone who enters! Stay tuned for more exciting news and views on my blog - you can do this by subscribing to my email newsletter (free; no spam) below. This is one of the mandatory entry requirements, so do sign up! Do also subscribe to my newly revived YouTube channel here, and follow me on Instagram here. For more great giveaways, go to Julie’s Freebies & Sweepstakes, and BlogGiveawayDirectory.